Dwayne Perreault — When I saw that Horizon Wines was hosting a master class on Madeira, Vinhos Barbeito at Wine Professional, I knew I couldn’t miss it. This was for me the highlight of the three-day long wine exhibition, the largest in the Netherlands. Madeira is a tiny gem on the world wine map, producing a range of fascinating wines, some of which can last a couple centuries. But strangely it has been in a period of decline since the mid-19th century, when the island was hit by the powdery mildew and phylloxera plagues. Vintners chose to replant with inferior American grape varieties, then lost major markets in Russia and America to a revolution and prohibition. Eventually, the public perception of Madeira was downgraded to a cooking wine, and to some extent that misconception still exists today. The future of Madeira became a bit brighter in the late twentieth century, when producers began replacing hybrid and American vines with the noble varieties Sercial, Verdelho, Boal and Malvasia (listed from dry to sweet). The red-skinned Tinta Negra Mole remains the workhorse of Madeira, but Ricardo Diogo Freitas, the owner and winemaker of Barbeito, showed that it is also capable of producing worthy wines. Ricardo’s mission is to save Madeira the wine, whose biggest threat is now the more lucrative tourism industry. At one time, Madeira had over 150 winemakers; it is now left with five. Ricardo is a new style producer, striving to also create Madeiras which can also be enjoyed young, thus challenging the perception that only older Madeiras are fit for drinking. We were presented with six flights of wines from Barbeito, culminating with two Malvasia’s from 1875 and 1834! Flight one: 1. Rainwater 5 years old. Made from Tinta Negra Mole, which needs extra ageing. Soft in mouth, sherry-like. Ricardo forbids the use of caramel in his wines, but a caramel flavour is present. Bit fiery at the end. 2. Boal 5 years old. This sweeter grape can produce fuller bodied wines with less ageing. Even softer, with orange peel and candied fruits. Flight two: 1. Sercial 10 years old. A dry wine. Acidity is extremely important to Ricardo for all the wines he produces, so he fortifies his must and stops fermentation earlier than is traditional. Oxydation ensures that the wine gathers both sweetness and complexity. This is a blend of wines from 12 years with lovely tangy bitters. 2. Sercial Vintage 1988. Vintage wines must be aged 20 years in cask. A bit sweeter, with oxidative nut tones. Flight three (served with a dish of monkfish with octopus and a friture of echalottes and garlic): 1. Verdelho 10 years old. Verdelho is Ricardo’s favourite grape for Madeira. Luxurious in the mouth, exuberant and elegant with notes of toffee and lively acidity, which makes it a fascinating match for this seafood dish. Flight four: 1. Boal Colheita 2001. Medium sweet, Boal can be even more full bodied than Malvasia. Orange peel, raisin, caramel and cinammon melt in the mouth. 2. Canteiro Colheita 1995. A single cask wine made from Tinta Negra Mole with notes of lemon and lime. Flight five (Perfectly matched with a dish of sweetbreads, pear and artichoke mousse with a sauce of Sauternes, butter, gorgonzola and lemon): 1. VB Lote 2 Reserva. This is a blend of 60% Verdelho and 40% Boal. More sherry-like, but very soft and sweet. Flight six: 1. Malvasia 2000 Cask 40a. With 8-9 years cask ageing and many caramelised tones. 2. Malvasia 1875. My first 19th century wine was a Malmsey! The bouquet had older oxydized tones, wood notes, light acetone, hazelnut. Very dark and rich in the mouth, an explosion of walnut and dark rich fruit flavours with pleasant, intriguing wood bitters. Fantastic. 3. Malvasia 1834. Napoleon had been buried just 13 years before this wine was made. Perfumed oak in the nose and dark, rich molasses. Taste: bitter almond liqueur, orange peel, dark earthy fruit, very persistent and long lasting. Extravagant, so rich but still fresh and alive with ancient but vital acidity! 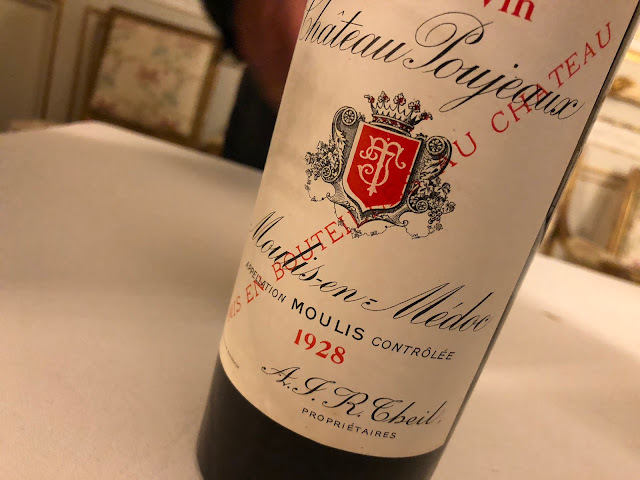 While sipping the 1834, I thought briefly of Napoleon, the Tsars, the founding fathers of America who all shared an admiration for a drink that must have tasted much like what I was tasting. It is said that George Washington drank a pint of Madeira per day. But to my horror and astonishment, as we were leaving, two young cooking students sitting next to me left their barely touched glasses on the table. Imagine waiting 176 years to be enjoyed, only to be spurned! I wanted to grab their glasses, but damned decorum wouldn’t let me. Neither would I. And I drank every last bit of this 1834 madeira.